How does one begin the monumental task of empowering our children to ensure lifelong success? Our well-rounded teaching program draws from different philosophies of great teachers. 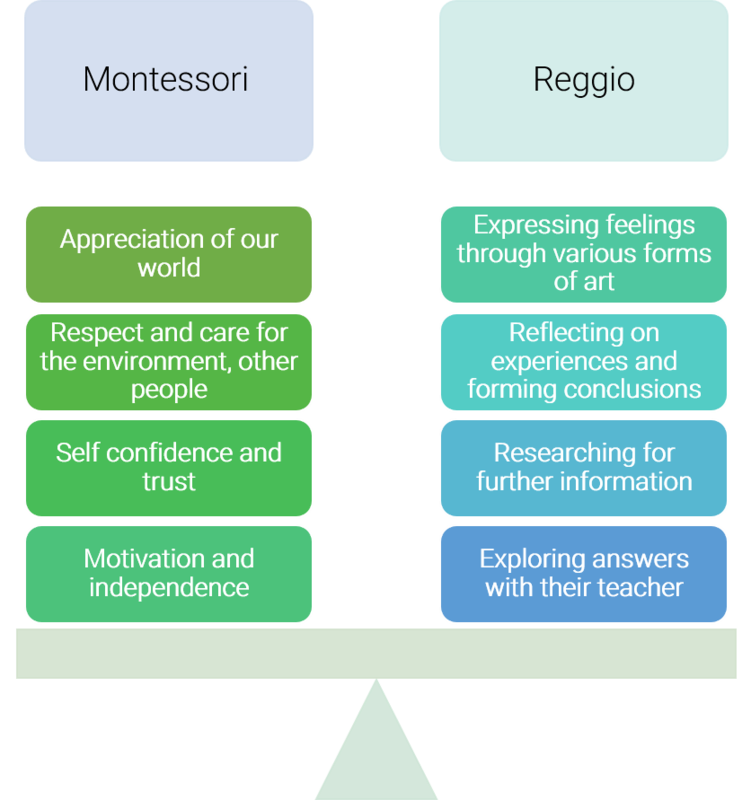 The academic aspect is mostly based on the teaching methods and research of Dr. Maria Montessori and Reggio Emilia. Whereas the social and emotional side draws from the teachings of our current, great masters such as Eckhart Tolle, Wayne Dyer, Don Miguel Ruiz, Gordon Neufeld as well as Rise & Shine’s own unique programming developed through decades of experience. By building a solid foundation of knowledge through our multi-level programming encompassing all facets of learning, assimilating proven theories of play-based creativity and traditional academic teaching. Providing opportunities to build social interaction, verbal competency and problem solving skills to foster divergent thinking and self-confidence. Through teaching important day-to-day skills as well as engaging children in active play to build strength and good character, conducive to becoming a kind, smart and positively-contributing member of our society. By practicing mindfulness through meditation and yoga for self-regulation and self-awareness. Living with integrity and being true to oneself. Always doing one’s best, no matter what your best is on a given day. Being mindful of the present moment whilst learning from the past and planning for the future. Thinking from love not only daily but more so when faced with difficult choices. Not to take things personally by evaluating a situation and looking at the “big picture,” so as to protect oneself emotionally. The academics of our philosophy are based on the teaching methods and research of Dr. Maria Montessori and Reggio Emilia, each with complementing goals, making for a well-rounded and complete program. Children learn respect for each other, for other people, for property as well as themselves. Conversely, teachers also respect the children, their various levels of development, their ideas about the world and how it works and their ability to practice those ideas. Children learn to express their emotions through socially appropriate ways and to respect the feelings of others. We strive to provide our children with life long skills that teach work ethics such as finishing what you start, organization, tidiness, classroom etiquette and the pride of work well done. We recognize their strengths always encouraging continuous growth whether it is cognitive, physical, emotional or social. Our goal is to help the children in our care reach their full potential before kindergarten.